The HP Compaq Business Desktop dx2000 is a simple, low cost desktop PC providing businesses with the performance and quality they need for the essential and most common computing requirements. 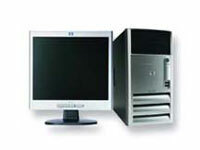 Fully featured and expandable, this PC is designed specifically for businesses. Rigorous HP testing and qualification processes help to assure greater reliable operations and lower operating costs. Expandable and attractive, the compact microtower design fits easily into any environment. Set on a desk, on the floor, wherever needed, the HP dx2000 works where you need it to work and provides for future expansion possibilities. One of the newest additions to HP's redesigned line of entry-level flat panel monitors, the HP L1506 Flat Panel Monitor is a stylish, business-oriented 15 flat panel monitor that delivers essential performance features at competitive prices for small-to-medium businesses and mainstream corporate environments.